The directory displays a list of available departments for Supervisor. Depending on the schedule (flexible, hard, not standardized) on the form, fields will be displayed. If the department has a flexible work schedule, then only the length of the working day will be set on the form. For a not standardized schedule, the form will display the Working hours, Overtime calculation, Lunch, Lateness, Absence. 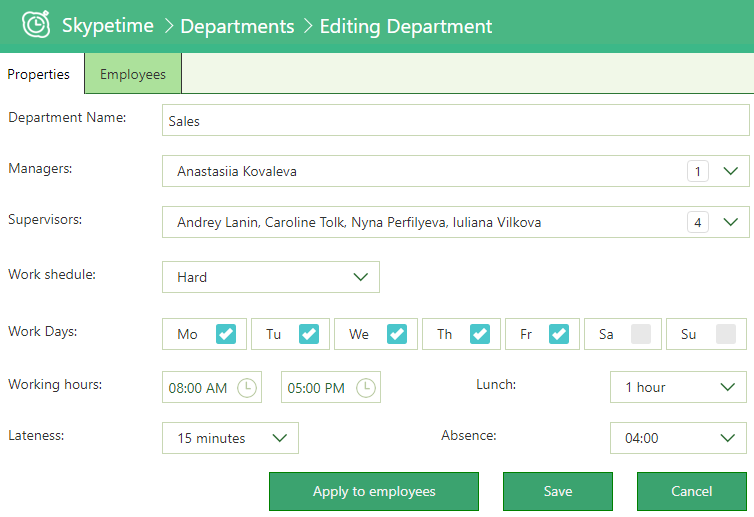 In case you need to change the working hours, lunch time, lateness, absence of all the employees of the department, it is enough to make changes and click on the button “Apply to employees”. To change the department (new manager or inspector) have been saved, you must click on the “Save” button. You can also see the list of department employees and, if necessary, set an individual schedule for each separately. To add employees to the department, the Manager needs to go to the Employees tab and click on the icon .